My tea room is facing north, which means I don't get any direct sunshine during winter. This week, I could catch the first late afternoon rays during this Cha Xi. I chose this wide, black, elegant flowery Cha Bu to match my spring Ali Shan Hung Shui Oolong. This tea's slow charcoal roast is warm, sweet and dark. At the same time, there is a richness, purity and lightness that is delicate like flowers. A few leaves (see picture) were enough for my modern zhuni Duo Qio Hu. The tulip shaped ivory porcelain cups on the Cha Tuo looked like flowers with a golden heart! A white and purple orchid I brought back from Ilan graces this Cha Xi. I'm looking forward seeing each bud open up, one by one, this spring. 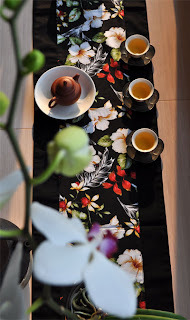 These flowers bring beauty and harmony to my tea enjoyment. They complete the visual experience with a touch of nature. 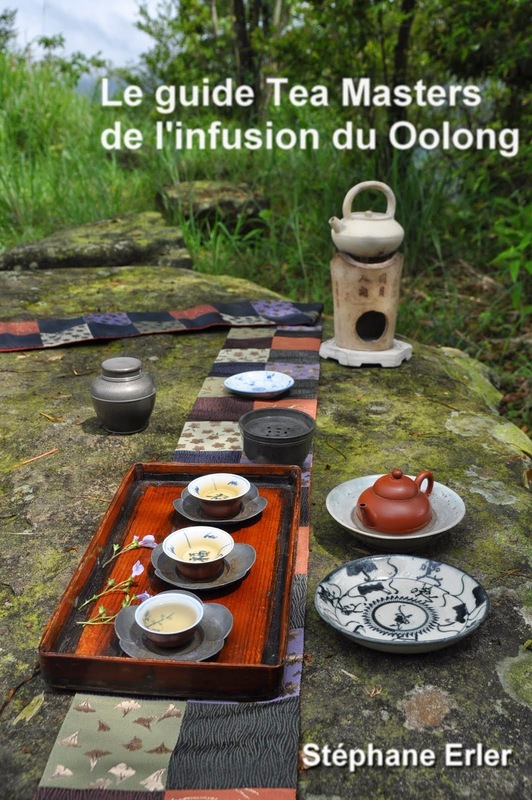 A reader recently told me that he finds this tea "really fantastic. So complex, so rich, so many tastes and tones. Great! Exactly my cup of tea". 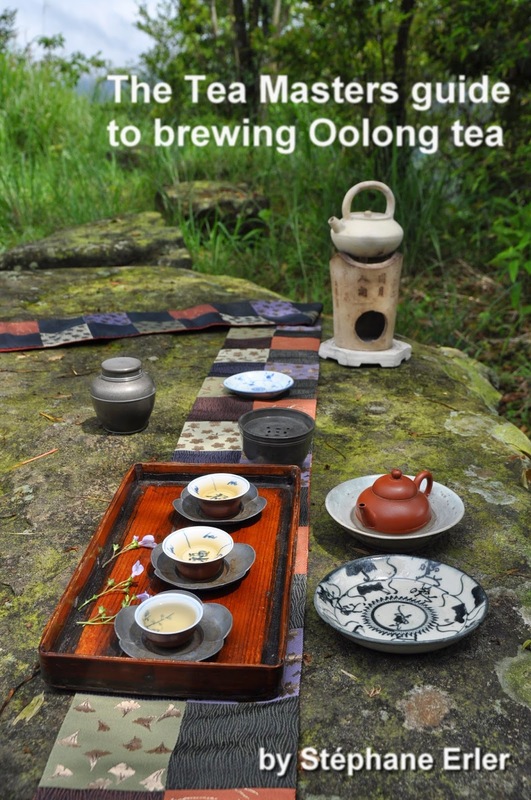 It's a tea for those who like excellence and traditionally roasted Oolongs. 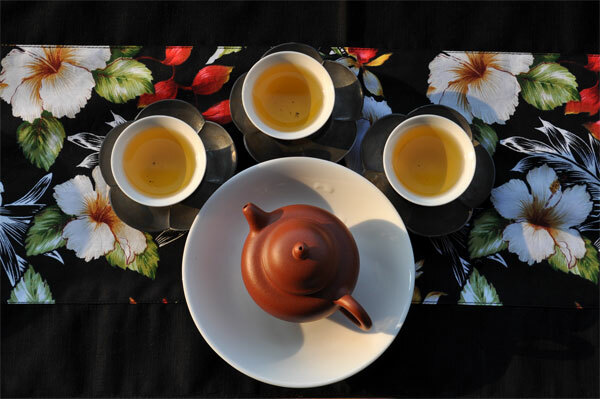 It has the cha qi and concentration of a high mountain Oolong and the sweet fire of a master charcoal roasting. There's a great balance between the fire and the freshness. The flavors stay endlessly in my mouth. This is a tea I plan to keep some for my old days! At each encounter it seems smoother and sweeter. I learn to appreciate and love it more and more. I can imagine myself drinking it in 20 years and still be mesmerized by so much distinction and warmth! Would this tea age well as long as it had periodic roasting? 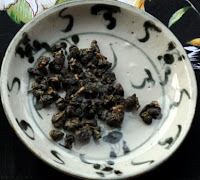 I plan on reviewing an ali shan oolong as well pretty soon, but it is unroasted. 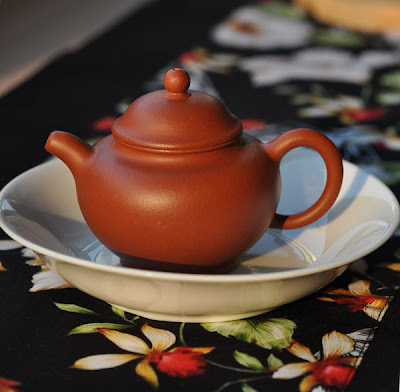 This tea will even age well without periodic roastings, if it is kept well in a dry place (and because it was roasted well in the first place)! what a sumptuous Cha Bu, this cha xi is full of joy! Yesterday (April 5) I have found, opened and tried the last sample of tea from you. It was this Ali Shan Hung Shui Oolong and its package said- April 5. What a coincidence! Just year after harvest. I really enjoyed this tea. Some fruity, like oranges fragrances on beginning and roasted aftertaste in ratio I like. Thank you.